Fixed and free sprocket in rear wheel with 16D. Helliot Bikes, the best “quality-price-design” option on the market. 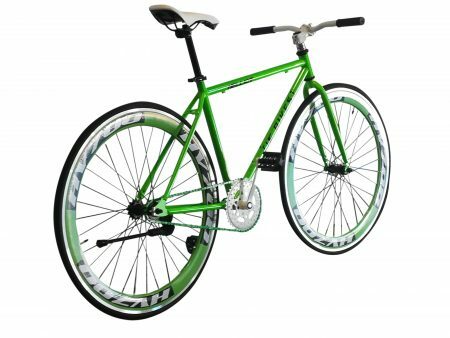 Are you looking for a green fixie? We have the bicycle you need! With our Brooklyn model you will have your green fixie bike at the best price. The best components of the market are here to make your bike a unique experience. This design follows the line of our Brooklyn red and pink. 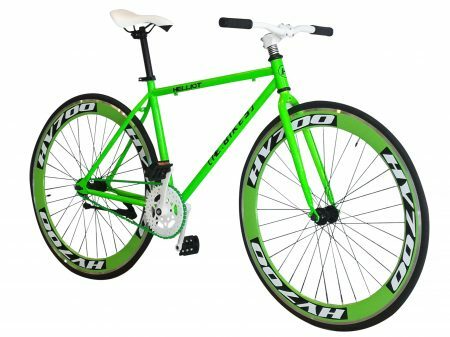 In this case, its green color gives you that feeling of sportsmanship and youth that no other green fixie bike can offer you. This bike is inspired by the pure green, the green we look for every time we climb a mountain pass or cross the gardens of our cities. Despite being one of the five neighborhoods of New York, Brooklyn has its own identity. For this reason, our Fixie Brooklyn are the fixie bikes with the highest visual level. A bicycle with a unique personality that will make your travel more than a movement for your city. You can see another of our Brooklyn model bicycles in action here! Don’t forget to visit our facebook page and become a fan to be up to date with promotions, coupons, news, events, new models… and much more. £ 689,69 £ 473,89 Sale! £ 388,44 £ 249,46 Sale! £ 185,58 £ 154,51 Sale! £ 387,57 £ 240,83 Sale!